This winter we want you to dust off the old fireplace and reimagine what it can do for your home. Whether you love a modern one or a rustic old-world style fireplace, there is nothing quite as comforting as flickering flames in the winter. 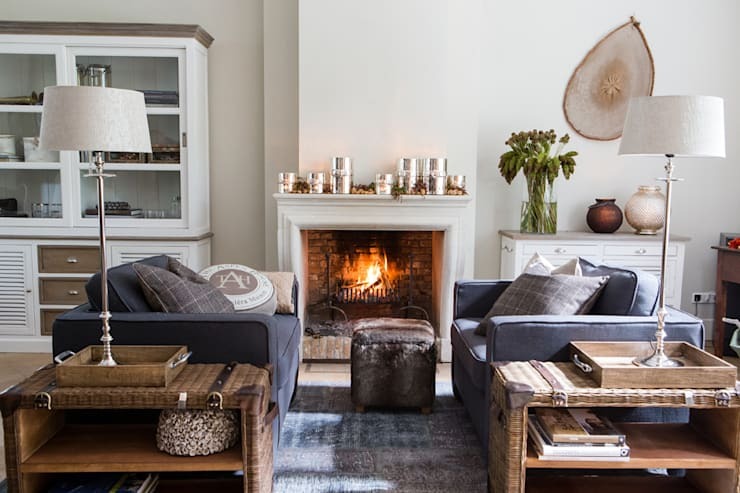 Today on homify we want to show you how having a fireplace in the home can uplift your style. 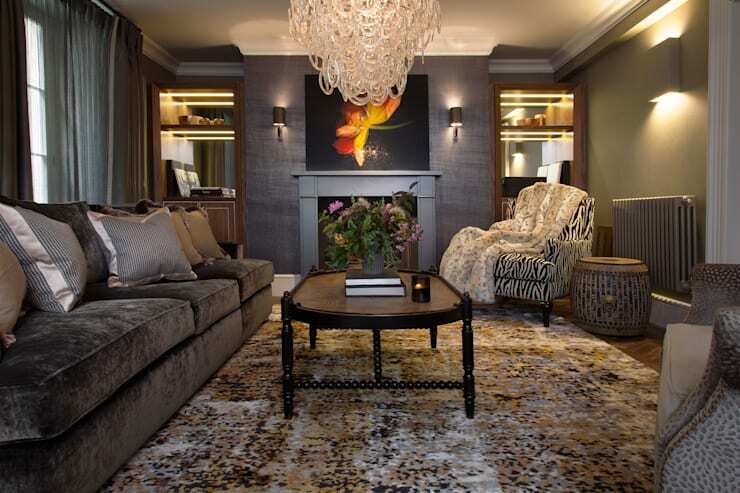 More than just a source of warmth and light, a fireplace can be an anchor of style in any room. Some of these fireplaces are so stunning that it’s a pity the weather doesn’t warrant a fire year round! Imagine cozying up on a chilly weekend afternoon by the fireside with a glass of wine and a good book in hand. Fireplaces have charmed us for hundreds of years and their appeal shows no signs of fading away. We hope these 9 tips fire you up. Fireplaces come in a range of styles. There are traditional wood-burning fireplaces as well as gas and electric varieties. No matter what style you prefer, they are all excellent at bringing warmth and character to a room. Here is an example of a more modern fireplace design. Covered by protective glass, it has a simple and clean look. To keep a room open and minimalistic try opting for no mantle as they have here. They painted the surrounding walls and kept the chimney wall gleaming white. Now the fireplace stands out from the dark tones of the room. This also helps to add depth to the living room. White walls are easy to clean and simple to touch up. A negative painting detail like this is an easy way to turn your fireplace into a room’s star feature. Those lucky enough to have a classic fireplace like this should take advantage of its vintage appeal. 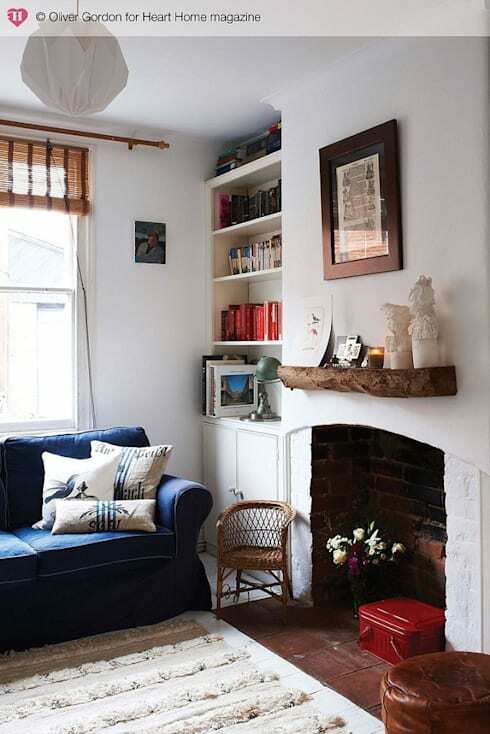 Despite its size, this petite fireplace adds warm vintage charm to the room. It's the addition of vintage housewares and mantle display that completes the look. We love the understated style of this fireplace set up! Vintage decor like this is creates a timeless look. If you are interested in taking advantage of all your home has to offer, homify knows professionals who can help you flatter the natural beauty of your home. Many homes and apartments don’t come with a fireplace. Or, perhaps your chimney was closed up long ago, leaving the exterior shell. Either way, it’s simple to create a charming faux fireplace like this. True, it won’t provide the same amount of warmth that a real fireplace can. We think that a faux fireplace like this is an elegant statement piece to have in your home. The truly ambitious could even create this as a DIY project in a weekend. Add some pillar candles and any other decor features you want, as long as you don’t create a fire hazard. The result is a clever and cozy homage to a fireplace. A fireplace doesn’t have to be the center of attention in your living room Especially if you have a modern fireplace, it can easily become an accent for the room. Here the fireplace has to compete with the television for attention. 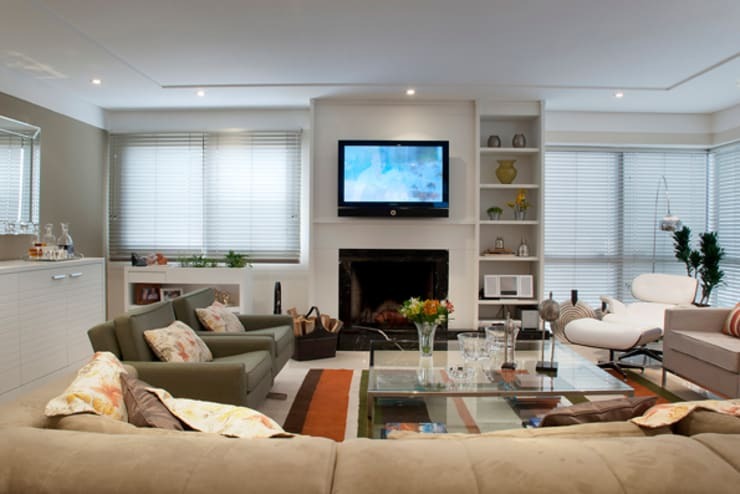 By using electronics to take the focus off of the fireplace, the room is more casual and contemporary. What you do with the wall space right above the fireplace has a big influence on the design for the rest of the room. This functional living room looks great with a subdued fireplace. Not everyone wants to share their fireplace with electronics, of course. We invite you to brighten your home and make the room appear larger by adding a mirror above the fireplace. 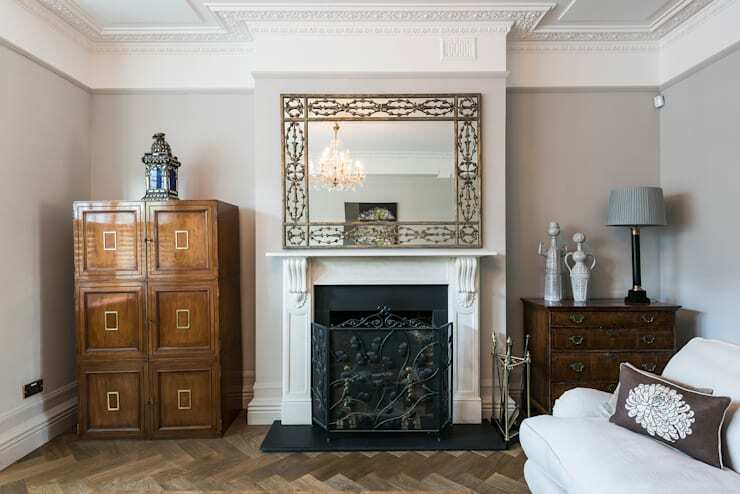 High ceIlings with ornate trim and attractive vintage furniture decorate this period apartment. The central fireplace fits in beautifully here. The glow from the flames would glint through the iron grate and glimmer off the polished parquetry flooring. Adding a gold trimmed mirror enhances the space by reflecting the chandelier creating a bright and expansive room. Above the fireplace is a great place to show off your favourite piece. This bold floral painting has the same colours as a roaring fire. It transforms the room into a luxurious space. The blue tones of the textured wall and mantle offer great contrast for the artwork to stand out. If not a mirror or a television, consider adding a well thought out print to the space above your fireplace. It’s an easy way to upgrade the style of your home in an instant. Symmetry is typically a critical element of eastern design principles. However, even in western home design, symmetry is a simple way to add finesse. 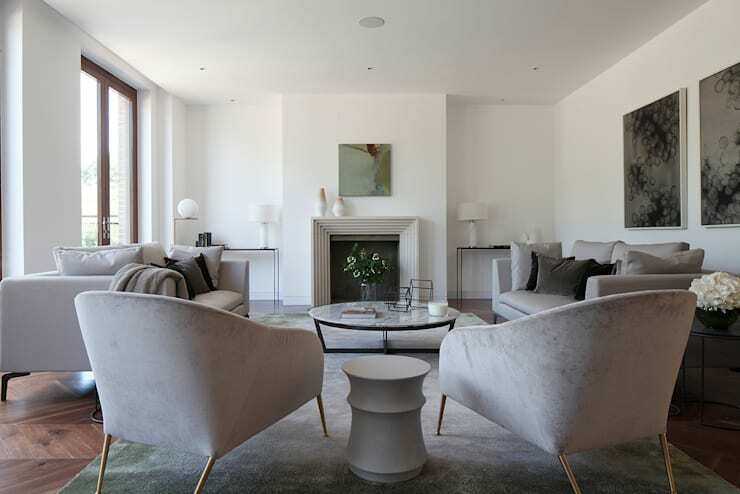 This austere contemporary living room is beautifully symmetrical. Using symmetry to enhance your fireplace it becomes an perfect focal point for the room. We love the look of a balanced space like this. The room’s symmetry subtly highlights the fireplace at its center. From the rustic vintage to the ultra modern, there is a fireplace for everyone. 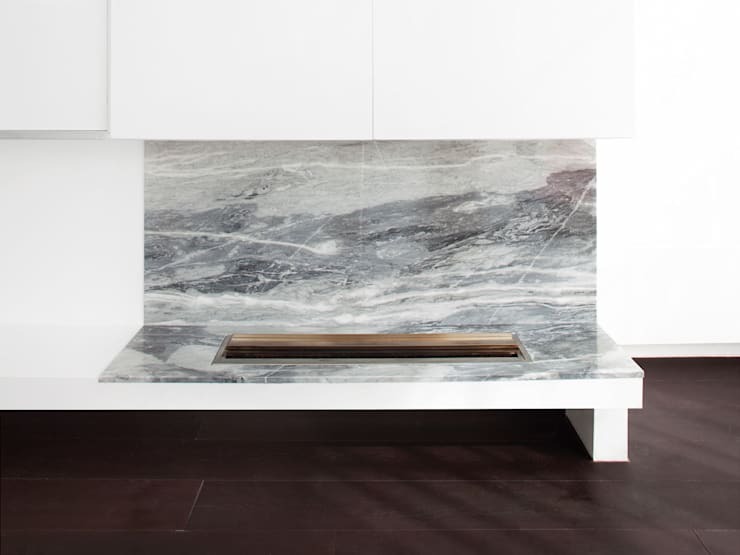 Check out this gorgeous minimalistic fireplace. The stripped down look of this fireplace is inspiring. Simplicity at its best! We love this bold marble fireplace. It has negative details and lacks any of the traditional fixings of a fireplace. It's easy on the eyes and almost magical to behold. A minimalist fireplace like this shifts focus in your home to the elemental character of fire. It's a bold feature for your home. Fireplaces can be a lot of work to maintain. You may find yourself with one that was poorly maintained and are at a loss about what to do about it. We suggest working with the natural rustic look of a forgotten fireplace like this. The brick has been painted white to brighten up the area. A wood shelf acts like a mantle above the fireplace. Whether you decide to use the fireplace or not, it doesn’t have to drag down your home. Help your fireplace lift the room up by matching your decor to its charms. We hope you enjoyed our tips to help feature your fireplace in your home this winter. For more home inspiration, please check out our feature on 10 homes we would love to escape to this winter! How will you decorate your fireplace?